This is such a cool poster for dorm rooms. It's quite stunning, which makes it a perfect addition to dorm room decor. Scenic dorm room posters are great additions to college wall decor. You get to have the scenic view that you want in your college dorm room and you also get to add relaxing, inspiring views to your dorm room decorations. Plus if you always wanted to visit the area or it's your favorite place, you get to look at the place you love every day in your college dorm room! Scenic views can be of more than a city and still be stunning. 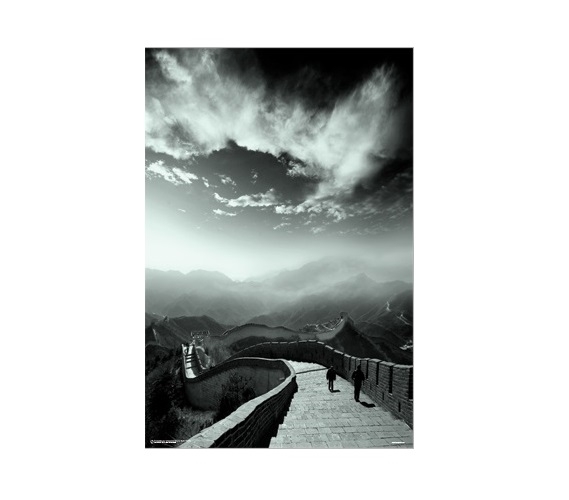 Our To The End of the World The Great Wall Dorm Room Poster features the Great Wall in a grayscale photograph that is breathtaking. Our To The End of the World The Great Wall Poster is a must have dorm item for eye catching dorm room decor. This dorm essentials item features the Great Wall going on as far as you can see. In the backdrop of this dorm necessities item, you have mist and clouds that add to the impact of this beautiful college poster. The photograph in this dorm wall art is grayscale, which adds even more eye catching impact to your dorm room decorations. The colors of your other college supplies will really pop and stand out with our To The End Of The World Great Wall Dorm Room Poster in your wall decorations for dorms!